iTunes and iCloud are the most comment ways for iPhone users to backup iPhone. However there are various reasons for them not using iTunes or iCloud. For example, iTunes or iCloud backup are not viewable, and free iCloud storage is limited. Is there any other software that can do this job? We are here to bring you a short list of iPhone backup software for your consideration. Each software has some differences from the others, so we will introduce the features of the software so that you can tell which one is the best for you. The first in the list of iPhone backup software is iMyFone D-Port Pro which is the most recommended software among all. D-Port Pro can be considered as one excellent substitute for iTunes or iCloud if you want to backup your iPhone completely as well as selectively. 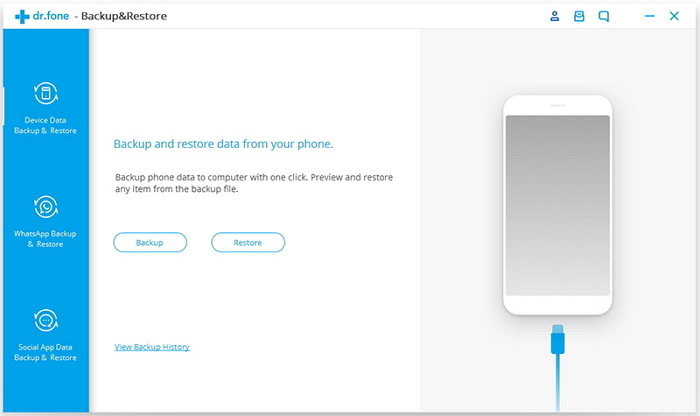 This means you can backup your device fully, and if you want only specific data to be saved, you can also do that with this software. The backup feature of this tool is completely free. No previous backup files will be replaced using this superb tool. You can keep all the different backups you made in different time. One can also view or extract data from the backups without restoring the backups to device. You can also flexibly restore the data to your choice if you want. It is full compatible with iOS 11.1 and iPhone 8/iPhone X. This is a powerful tool which is able to save numerous backup without overwriting the earlier backup files. You can make full iPhone backup in a short while. When you want to make a selective backup of WhatsApp, WeChat or messages, you can easily do it with iMyFone D-Port Pro as well. 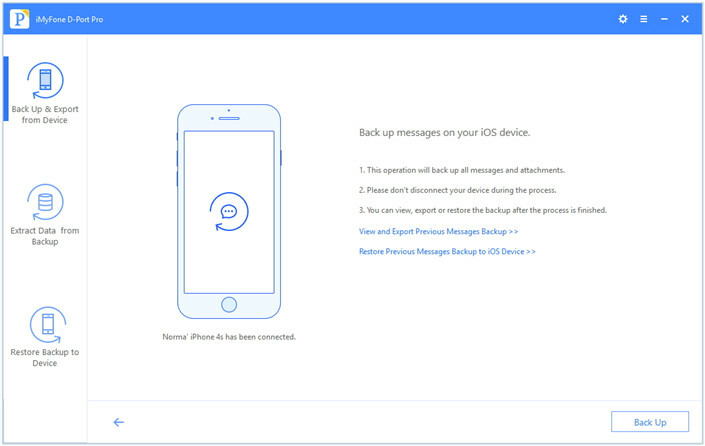 Here are the steps for making a separate backup of messages. Step 1 – Launch the program and choose "Back Up & Export from Device". 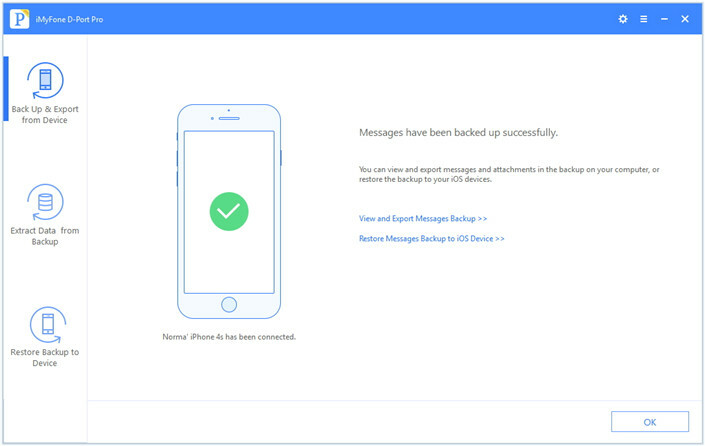 Step 2 – Now, select "Back Up Messages" and click on "Back Up" to continue the process. Step 3 – As soon as the process completes, you will be able to see the notification for that. These backups can be restored to iPhone as well. You can also selectively restore particular type of data from the backups made by iTunes, iCloud or iMyFone D-Port Pro to your device. 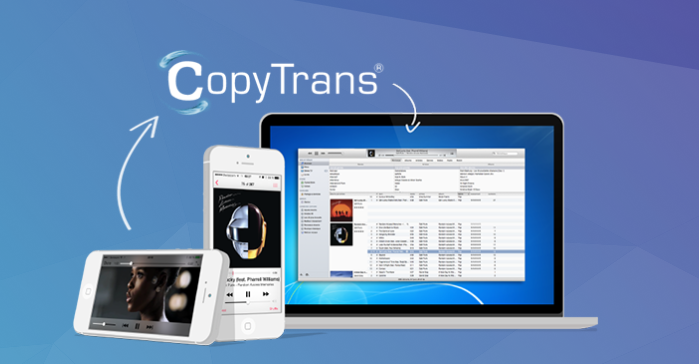 You can also use CopyTrans to backup your iPhone. It has a user-friendly interface which makes it easy for the users to use this program. 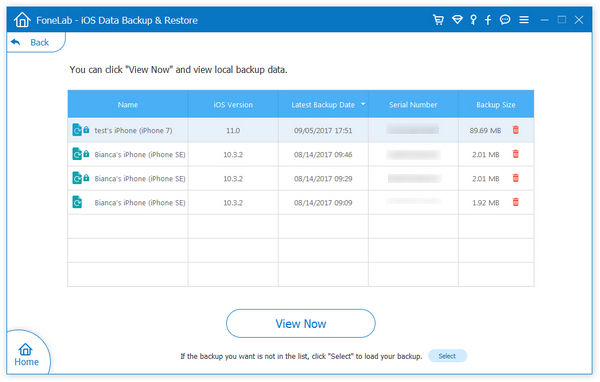 Although it's an easy to use iPhone backup software, the user is only able to save only 50 contacts for single purchase. You need to purchase for more backup option. With CopyTrans, you can easily organize, delete or edit information. Aiseesoft Fonelab is a yet another iPhone backup software which is designed for Mac as well as Windows operating system. A lot of data can be saved with this software that includes your reminders, photo albums, contacts, music and videos. This iPhone backup software is compatible with iOS 9 which makes sometimes unfavorable for the users in this latest iOS version trend. Another in the list is dr.fone iOS Data Backup & Restore which is one-click backup and export software. This fully compatible with Windows 10 or Mac 10.11 software works without loss of data. This software is also easy to use and one can use this to backup, export or print their iPhone, iPod or iPad data. Plus, you can preview the backup and restore anytime with the help of this software. Backing up your iPhone regularly is always the smart move to save your data so that data loss can be made up in future. 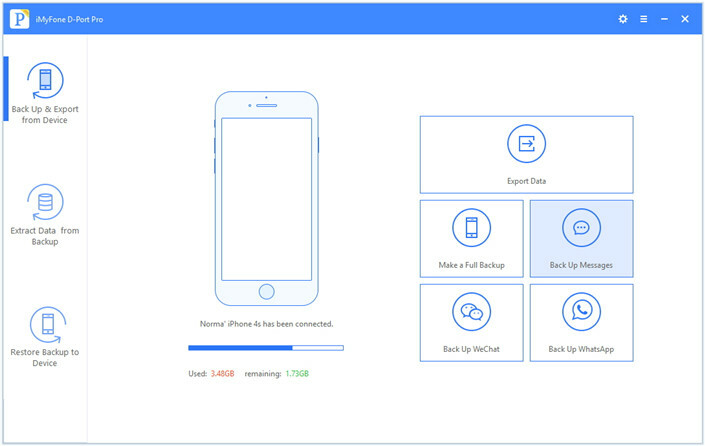 We introduced different iPhone backup software which no doubt contain different specialties or drawbacks. Go ahead and choose the best iPhone backup software to save your data.